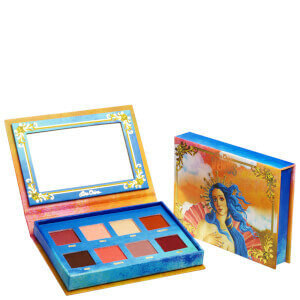 Create heavenly makeup looks with the Lime Crime Venus III Eye Shadow Palette, a collection of eight pink-themed shades in matte, metallic and iridescent shimmer finishes. From rose gold to minky brown, the richly pigmented shadows glide onto skin like silk, even doubling as highlighters for an extra-glowy finish. Offering superior colour payoff, enhanced blendability and no-fade wear, the eyeshadows allow you to create endless, illuminated makeup looks. 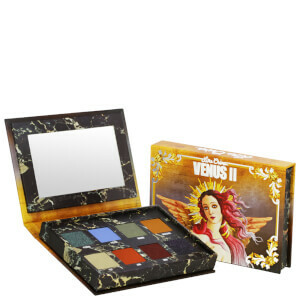 Housed within the signature mirrored palette with colourful Venus artwork. Beloved (Eye): Mica (CI 77019), Alumina, Ethylhexyl Palmitate, Zinc Stearate, Silica, Tin Oxide, Dimethicone, Caprylyl Glycol, Hexylene Glycol, Ethylhexylglycerin, Phenoxyethanol. May Contain/Peut Contenir [+/-]: Titanium Dioxide (CI 77891), Iron Oxides (CI 77491, CI 77499). Ecstasy/Paradise (Face): Mica (CI 77019), Ethylhexyl Palmitate, Zinc Stearate, Silica, Tin Oxide, Dimethicone, Caprylyl Glycol, Hexylene Glycol, Ethylhexylglycerin, Phenoxyethanol. May Contain/Peut Contenir [+/-]: Titanium Dioxide (CI 77891), Iron Oxides (CI 77491, CI 77492, CI 77499), Manganese Violet (CI 77742), Red 27 (CI 45410:2). 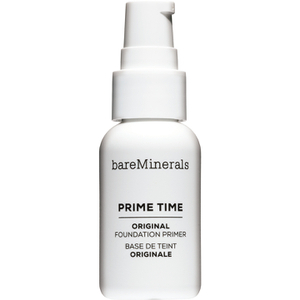 Beam (Face): Calcium Sodium Borosilicate, Ethyhexyl Palmitate, Zinc Stearate, Silica, Mica (CI 77019), Bis(Glycidoxyphenyl)propane/Bisaminomethylnorbornane Copolymer, Synthetic Fluorphlogopite, Tin Oxide, Dimethicone, Aluminum Hydroxide, Caprylyl Glycol, Hexylene Glycol, Ethylhexylglycerin, Phenoxyethanol. May Contain/Peut Contenir [+/-]: Titanium Dioxide (CI 77891), Iron Oxides (CI 77499), Ferric Ferrocyanide (CI 77510), Red 28 (CI 45410), Red 22 (CI 45380). Rapture (Eye): Mica (CI 77019), Calcium Titanium Borosilicate, Ethylhexyl Palmitate, Silica, Zinc Stearate, Tin Oxide, Dimethicone, Caprylyl Glycol, Hexylene Glycol, Ethylhexylglycerin, Phenoxyethanol. May Contain/Peut Contenir [+/-]: Titanium Dioxide (CI 77891), Iron Oxides (CI 77491). Bliss/Dreamy (Face): Mica (CI 77019), Zinc Stearate, Ethylhexyl Palmitate, Silica, Dimethicone, Caprylyl Glycol, Hexylene Glycol, Ethylhexylglycerin, Phenoxyethanol. May Contain/Peut Contenir [+/-]: Titanium Dioxide (CI 77891), Iron Oxides (CI 77491, CI 77499), Manganese Violet (CI 77742), Red 27 (CI 45410:2), Yellow 5 Lake (CI 19140). Heavenly (Eye): Mica (CI 77019), Alumina, Ethylhexyl Palmitate, Zinc Stearate, Silica, Tin Oxide, Dimethicone, Caprylyl Glycol, Hexylene Glycol, Ethylhexylglycerin, Phenoxyethanol. May Contain/Peut Contenir [+/-]: Titanium Dioxide (CI 77891), Iron Oxides (CI 77491, CI 77499).